A rash on a baby's neck can be disconcerting for new parents. How did it get there? Should you be worried? There are many things to think about, however, skin rashes are fairly common. In most cases, the problem is normal and will get better on its own. It is important to identify a rash by its location. Check if it is on the neck only or if the rash appears in other places as well. If it is found an area other than the neck, it may be one of many common baby rashes. Keep in mind, some rashes are found in skin folds, so a neck rash might also appear in the diaper area or armpits. Once you have identified the placement of the rash, it is time to determine the cause. Babies don't have very long necks. In fact, the chubby skin folds under a baby's chin are part of what makes them so cute! The downside is that those folds encourage the formation of a rash. According to Dr. Alan Green on Parents.com, infants are prone to rashes, especially before they can hold their heads up on their own. Since the baby cannot hold up its head, the skin is constantly rubbing against itself. This causes skin irritation, which leads to the development of a rash. This will often clear up on its own once the baby learns to hold its head up without additional support. This lessens the friction and decreases the likelihood of a reaction. To deal with the problem, avoid using soap on the affected area and keep the skin dry. Occasionally, a baby will develop a fungal infection in the skin folds. A type of fungus called candida, commonly referred to as yeast, causes a form of diaper rash to occur. This happens because yeast thrives in warm, moist places, like neck folds. When it reproduces rapidly, this causes small red bumps to appear. There are many baby yeast rash remedies to consider, but the most important thing to do is keep the skin as dry as possible. 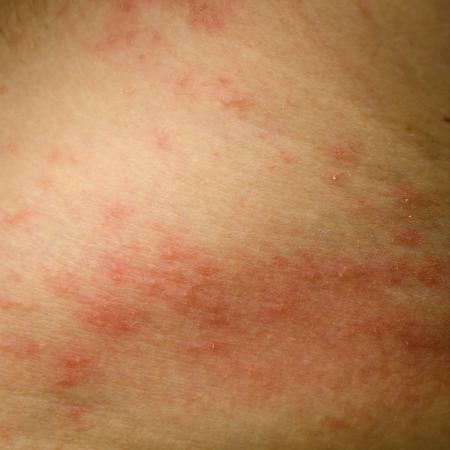 If the rash does not improve or appears to be spreading, visit your doctor. He or she will assess the rash to see if it is in fact a candida infection. If it is, he or she will prescribe a simple anti-fungal cream to treat the infection. It's important to treat the infection; according to Healthline.com, if left untreated it is possible the infection can enter the baby's bloodstream. "Stork bite" is the common name of a birthmark that can appear on the back of a newborn baby's neck. A stork bite isn't actually a rash, but a flat, pinkish spot on otherwise normal-looking skin. It does not hurt or itch and is caused by the stretching of certain blood vessels. The mark can change in color, and may look darker when temperatures change (or if the baby is crying), and lighter if pressure is applied. 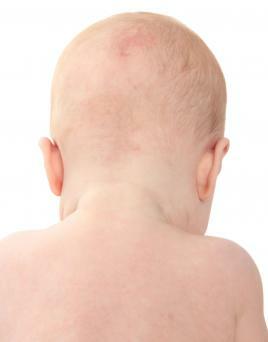 One third of all newborn babies have this type of birthmark - and they typically fade on their own. Stork bites go away after a few months, but occasionally will last longer, or even remain permanently. If the mark lasts for more than 3 years, a doctor may recommend laser removal. In the summer, a baby's skin can become irritated by the heat. Prickly heat rash occurs because the sweat glands are not fully developed. This creates small red bumps that tend to appear in places that stay warm and damp from sweat. That includes the diaper area, armpits, and the neck. 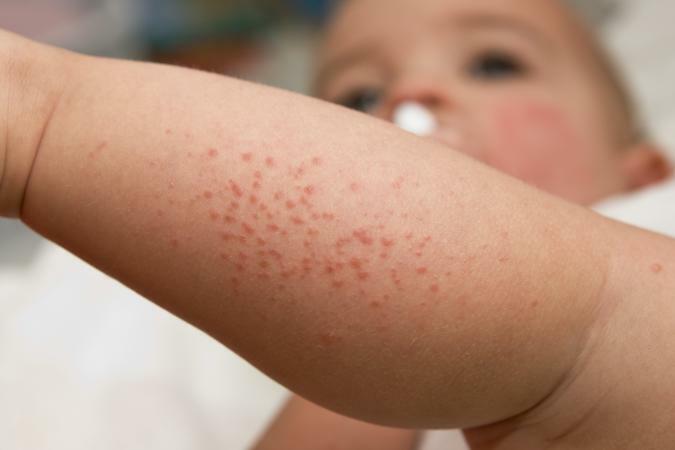 Treating heat rash is typically simple. Focus on keeping the baby cool and comfortable, be sure to dress her in loose clothing, and keep the affected areas dry. The rash should disappear on its own. However, a pediatrician may recommend that it be treated with an over-the-counter cream or calamine lotion, if irritation persists. According to St. Louis Children's Hospital, a one percent hydrocortisone cream (not an ointment) can be applied to treat itchy heat rashes in babies and children. Another type of rash is intertrigo. This is typically found in skin folds where the skin presses or rubs, such as the chin, neck, or armpits. A rash can develop when the area becomes damp, from sweat or not drying thoroughly after bathing. This issues tends to affect babies under six months old who cannot lift their heads independently. According to American Family Physician, to treat this type of rash you should gently cleanse the area, keep the affected area as dry as possible, and apply a barrier ointment such as zinc oxide or petroleum jelly to prevent friction. It's important to note that intertrigo can resemble other types of rashes, and it is common for a secondary bacterial or fungal infection may be present as well. If simple at-home measures don't help, seek help from a medical professional. One of the most common infant skin conditions is eczema. According to the National Eczema Association, this issue affects over 30 million Americans.... babies included. It can show up from 3 or 4 months on. The skin may be dry, patchy, red, or covered with small bumps, depending on the severity. Eczema can be triggered by things like extreme temperatures, certain types of soaps, and fabrics. Baby skin care is especially important when you are dealing with this issue. Minimize the effects of the condition by washing with a fragrance free cleanser and adding moisturizer to damp skin once or twice a day. If eczema is severe, speak to your doctor about treatment options. They may recommend a stronger lotion or a steroid ointment. Certain irritants can cause a rash to occur on a baby's neck. This is referred to as contact dermatitis. There are many contact dermatitis causes, including soaps, detergents, plants, and personal care products. It usually creates red itchy bumps on the affected area. The first thing to do is determine what is causing the reaction (for instance, a new lotion or detergent) and eliminate it. This may take some trial and error, so in the meantime, treat the rash itself. According to SkinSight.com, if the neck appears red and dry, moisturize it petroleum jelly or a mild moisturizer. Irritated skin can be treated with zinc oxide, while itchy areas can be treated with an over-the-counter hydrocortisone cream (0.5 - 1%) twice daily. Be sure to book an appointment with your doctor if the issue persists. 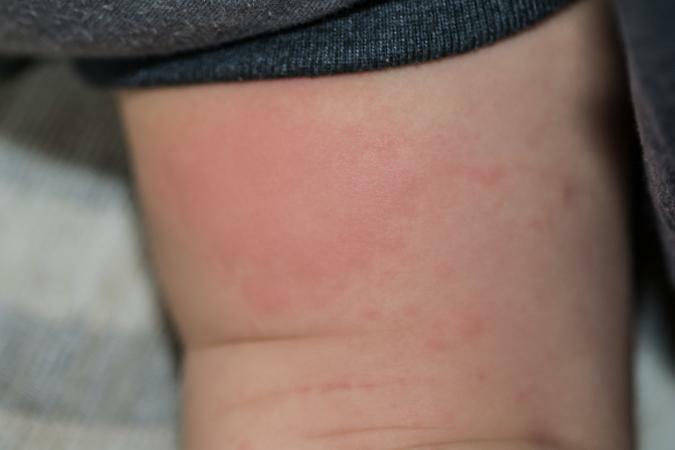 When it comes to hives in babies, they often appear as raised red bumps on the skin. Sometimes the bumps are small and other times they are quite large. They may be found all over the body or in a specific area, like the neck. Most commonly the symptom of an allergic reaction, hives will affect more than 20 percent of the population at one time or another. There are many reasons hives can appear (from a bug bite to an allergy or an illness), so treatment is essential. 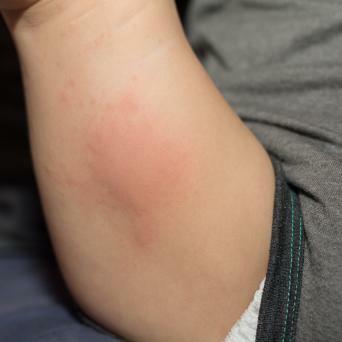 Contacting your pediatrician is best if your child is experiencing hives. 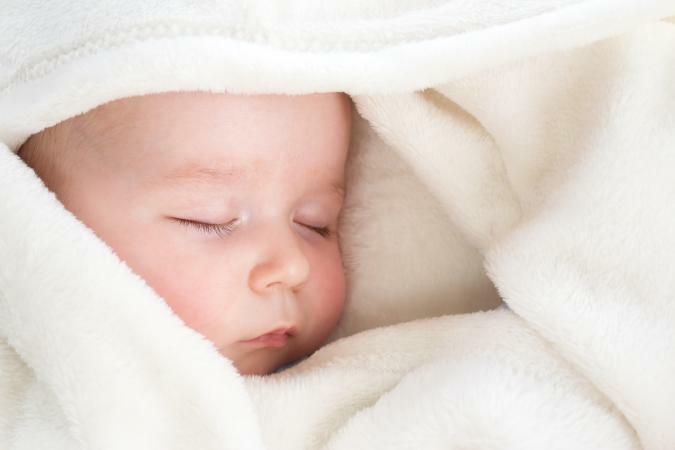 According to Dr. Sears, a physician may suggest a dose of Children's Benadryl to help reduce the swelling and combat the reaction, but it's important to make sure the baby is getting the correct dose for his or her weight. If hives do not go away after a few days, seek medical help as it may be a symptom of a more serious medical issue. Hives can be related(omit) to serious allergic reactions. Parents should be aware that when hives appear as a result of an allergic reaction, respiratory distress can also occur. If any sign of respiratory distress occurs, or the child's lips or tongue appear swollen, seek emergency medical care immediately. Most of the time, a neck rash is not serious. However, it is important to pay attention to any additional symptoms. Call your pediatrician if the rash is accompanied by a fever, if there are fluid or pus filled blisters, if the baby is not feeding properly, or is crying and cannot be consoled. These often signal a more pressing issue. Remember that you know your baby best. In general, any rash that worries you is worth looking into.